You developed HemoAde for Arm Pump – What is Arm Pump? Arm pump is a condition that affects many athletes that use their grip in their sport. Motocross racers in particular are prone to this condition due to the stress of rough riding conditions, high horsepower bikes. The technical term that is used to describe arm pump is Chronic Exertional Compartment Syndrome. It is essentially a pooling of blood that happens in the forearm when it is unable to easily flow through the athlete’s hands and back to the heart. This pooling of blood creates pressure in the forearms that negatively affects the mechanics of the muscles that control the throttle, brakes, clutch and the ability to hold onto the bike. Any athlete that gets arm pump can tell you, it is the single most debilitating issue in the sport today. There are a number of reasons that an athlete may get arm pump, starting with age. Many of the riders that contact ACTIONETIX because they are experiencing arm pump for the first time are in their late teens. This is when the vascular system is slowing its growth. This is also the time where the physical demands of riding are amplified. No longer are these athletes on small-frame bikes, which take a lot less effort to ride than the large frame four-strokes in particular. They have to hold on a lot more in order to harness the horsepower. So when the vascular system stops growing and the rider has to hold on tighter, it restricts blood flow through the hands and fingers and it creates arm pump. The second reason is directly due to age. As we get older and enter our 30’s, 40’s and 50’s the body’s physiology changes dramatically through the aging process. The vascular system is part of this transformation. Veins and arteries start to lose their elasticity, which decreases the ability for blood to flow. Plaque builds up in the vascular system, even if it is minor can also restrict blood flow. Arm pump becomes more and more prevalent as we age, and if not treated, it generally becomes worse. The third major reason that people can get arm pump is due to the byproduct of scarring from trauma to the fingers, hands, wrists and forearms. It’s no secret that Motocross racers break and sprain a lot of parts of their body, with the forearm, wrists and hands being very prevalent. These continued traumas create scar tissue and in many cases compromise blood flow. Other overuse conditions such a carpal tunnel syndrome also produce scar tissue that can hamper blood flow. 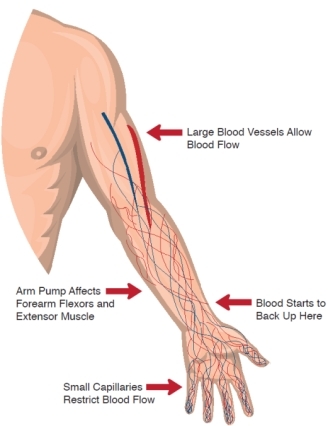 Again when blood flow is compromised with a condition such as carpal tunnel, it backs up into the forearm and causes arm pump. You simply have to keep blood flowing through the hands and fingers. Finally, many racers are not taking care of their fitness and nutrition the way they should. Most Motocross athletes are not hydrated sufficiently, which results in the thickening of the blood, particularly in hot conditions. This severely hampers blood flow and can amplify arm pump. There are also a number of nutritional modifications that can be done to allow the blood to flow more freely. Will every rider experience Arm Pump eventually? Every rider does get arm pump to some degree. Our bodies unfortunately are designed in a certain way where blood flow becomes more restrictive the further away from the heart. The hands, fingers, feet and toes are restrictive to blood flow, so it tends to get backed up as it tries to squeeze through the small blood vessels in these areas. Everybody is built in this way, so everyone will have at least minor issues at some time. Does Arm Pump affect athletes from other sports? Absolutely. There are a number of sports that require the use of grip. Mountain biking, Snowcross, Superbike and Jet-Ski racing are of course a couple of the most well-known sports where athletes experience arm pump. We also have a number of other customers that we never expected to see. We have some pianists and a number of mechanics that experience arm pump due to the repetitive motions in the hands, wrists and forearms. Why would you need arm pump surgery? Can’t you just take a few days off? Surrounding your muscles in your forearm is something called a fascia. The fascia keeps all of your muscles in place and aligned properly. It is a very strong tissue that has a very limited ability to stretch. Because it doesn’t stretch very well, when blood pools in the forearm it can create friction with the fascia. Like anything that rubs together long enough, inflammation and hardening can occur over time (like getting calluses on your hands). This can result in scar tissue which produces a lot of pain. If you catch arm pump early, you can avoid much of this process from happening. However, if you ignore the issues early on, and continue to let arm pump inflame the fascia, then surgery may be a final option, however we believe that the need for surgery is extremely minimal. Unfortunately, simply taking a few days off from riding will not change the long-term results of arm pump becoming a real problem. You have to be proactive in your riding style, fitness, nutrition and allowing your blood to flow properly. I’ll relate this to a Motocross bike. If your crank shaft becomes bent, you can probably still ride the bike, but not too its potential. Simply not riding it for a few days will not fix the problem – you have to change the part to bring the bike back to optimal performance. This is the same with arm pump – you have to change some things in order to prevent it or relieve it. Why did you develop HemoAde? I developed HemoAde for a couple of reasons. I ride and experienced arm pump in a race that I was leading. It got so bad in that race that I actually couldn’t hold onto the grips and I dropped the bike. For the last two decades, I’ve been involved managing or running sports supplement companies that develop products for bodybuilders that actually increase muscle pumps. I knew the mechanisms of action of how to produce a pump, so I went to work on developing HemoAde which is a product that will reduce muscular pumps. direction to launch the company and first product. 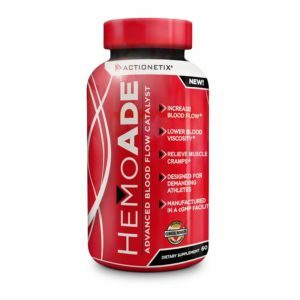 HemoAde is a clinically-proven performance enhancing product first and foremost, however the other benefits that it delivers is it also increases the safety and enjoyment for riders and racers. Flying around the track arm-pump free is one of the quickest ways to decrease lap times – and who doesn’t love a bigger trophy or bragging rights when you beat your friend or closest competitor on the track. HemoAde is a win, win, win product. How did you go about developing the formula? To be honest, the development of HemoAde took a long time. Because it is a true innovation there were no other formulas on the market to look at. The first step was to understand the mechanisms of action that produce arm pump. Once we established the issues with blood flow and the pooling of blood, we needed to develop a product that specifically addressed the ability to allow blood to flow through the hands and fingers so it would decrease the pooling in the forearms. We met with a number of potential ingredient suppliers that develop ingredients for blood flow. We felt we needed to have clinical evidence that supported not only the efficacy, but safety of the ingredient as well. We were able to find that from a supplier in Japan. They had performed exceptional research on increasing blood flow through the hands and fingers, and also had strong safety data including a trial that was done on clotting. This was very important to us because there is always a risk of bleeding when you have a “get off” on your bike. Dean Wilson in the US and Kyle Keast in Canada were both using HemoAde when they had significant crashes. We all know that Dean had issues with his ribs, lung and back, and Kyle broke his femur. Neither had any issues with clotting even with these substantial injuries. After we had the heart of the formula established, the R&D team went to work building on the formula. We wanted to ensure that HemoAde was a legitimate performance product that improved a rider’s ability to perform. We knew that cramping is an issue that is associated with arm pump and dehydration so we improved the formula by adding a well-documented but unknown anti-cramping ingredient. We also knew that if we were going to dramatically increase blood flow through the hands and fingers (by over 400 percent on average), we could benefit by delivering more oxygen to the working muscles as well. This is why we added specific amounts of vitamins that have been shown to increase the size and number of red blood cells. Last but not least, we developed a matrix of other proven ingredients to further assist with blood flow. These compliment or “super charge” the overall HemoAde formula. If HemoAde lowers blood viscosity, are there issues with blood being able to clot like there is with aspirin? We have clinical evidence illustrating normal clotting occurs while using the core of HemoAde formula. Other support-ingredients generally do not have any mechanism of action on blood clotting, so there is no issue with them. This was important for us to establish. We always note that every rider should discuss using HemoAde or any other sports supplement with their doctor. Also with any nutritional supplement, including vitamins and minerals, that you stop taking them two weeks before scheduled surgery. Your doctor will give you final recommendations, however this is a rule of thumb. What strategy do you recommend for riders to reduce or eliminate getting arm pump? 1. Be physically fit. This is a no-brainer, which can be improved on by every rider. We all don’t have the luxury of the top pros where training is part of their job, but getting out for a jog even a couple times a week, stretching and doing push ups and sit ups is a great start particularly for the weekend warrior. 2. Modify your nutrition. We have done a significant amount of research on foods that can naturally thicken and thin the blood. Foods like kale spinach, broccoli, tuna and blueberries are all very high in Vitamin K. Excessive levels of vitamin K are associated with blood thickening, which is something we do not want. Conversely foods like salmon, avocados and almonds actually can contribute to natural blood thinning and overall health. 3. Get a lesson or two with a top riding coach. They will teach you how to use your legs more and arms less. This will take some of the pressure off of your grip and at least help somewhat with arm pump. 4. Stay hydrated. Most of my athletes when they join the ACTIONETIX team are severely under hydrated. A good rule of thumb is to drink 1 oz. of water for every pound you weigh. There’s more to it than this depending on the temperature and activity levels, but this is the perfect place to start. A 160 lbs. rider would need 160 oz. oz. or 20 cups of water each day. 5. Use HemoAde. We designed this product to directly address arm pump and improve each athlete’s performance. We believe that riding arm-pump free is the fastest way to lower lap times. 6. Set up and maintain your bike properly. Great suspension goes a long way in decreasing the stress on your grip and forearms. We’ve never heard of suspension curing arm pump, but it can certainly help. 7. Avoid creatine. Many riders and racers that workout are using creatine. Although creatine is one of the best sports supplement ingredient on the market it is not for motocross racers. Creatine in simple terms is a cell volumizer that is used to increase the fluid volume within muscles. It will do this in your forearms, which is what you do not want. Check the label of your supplements and consider switching your brand if it contains any form of creatine. 8. Relax. Sounds easy, but it’s not when you have 20-40 other bikes chasing you around the track. Telling yourself to breath while you’re on the track is a key to staying relaxed. After working on this for a few weeks, you will not have to tell yourself to do it anymore as your subconscious takes over. 9. Warm up before you ride or race. Building a 3-5 minute routine before riding or racing will allow your blood to flow before you have to hold on to your grips. It also allows epinephrine (adrenaline) to flow through your body before the holeshot. This helps with heart rate and blood flow.